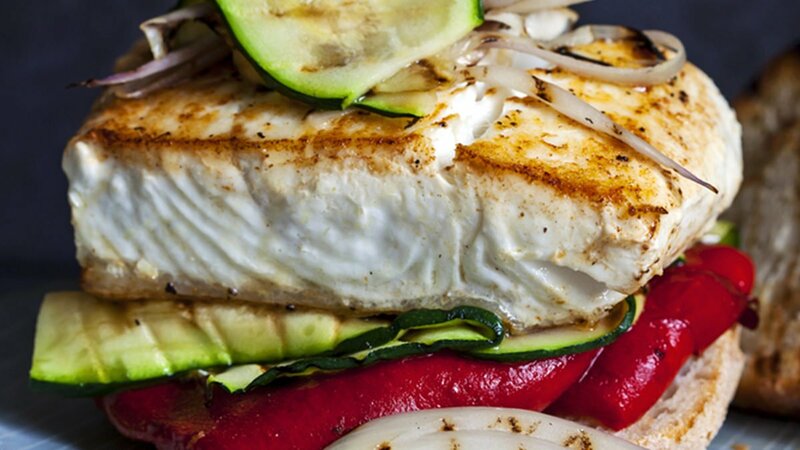 Like most fish, halibut is a high-quality source of protein and selenium, a powerful antioxidant that helps your body repair damaged cells and aids in decreasing inflammation (just like these foods). Halibut’s power-packed nutrients, including omega-3 fatty acids, niacin and magnesium, also help fight heart disease. Halibut is the largest flatfish in the ocean, and can grow up to an astonishing nine feet long! The fish we eat are either farm-raised or caught in the wild, with much debate as to which option is healthiest. Wild-caught fish are often considered the best option with less contamination due to their diet of smaller fish and algae. However, many farms now grow fish in a way that’s better for the environment, resulting in a safer-to-eat product. A whopping 80 percent of Pacific halibut are harvested in Alaskan waters and flash-frozen while still on the boat, so frozen fish might be better than fresh. What Is the Flavor of Halibut Like? This lean fish has a mild, sweet tasting white flesh, similar to tilapia. It’s thicker and firmer than cod. Because the flavor is so gentle, halibut pairs well with bolder seasonings like pesto, lemon juice and basil. Get inspired by our Pesto Halibut recipe. There’s “more than one way to skin this fish,” including baking, broiling, grilling, sautéing, poaching or steaming. But be careful: The lean meat dries out quickly if cooked too long. Here’s how to avoid overcooking fish—and these other mistakes. Article by Stephanie Harte for Taste of Home. View the original article here.